We often get tool review requests. This is one of them. 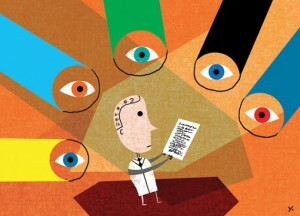 However – and this is a big BUT -, we feel it’s important that you understand how our review process works. Long story short, we don’t do paid reviews. Those who ask already know that we’re going to give our real impressions. If, in our opinion, the tool is a waste of space or a copy, we’ll say so. What you’ll read is our opinion; your experience may be different. Our honest reviews are geared toward offering you our insight, and the tool creators our feedback. We hope the owners of the tool can take some of these suggestions and consider their immediate impact to the user. What about the Microsite Masters SERP Tracker? Our tool reviews are done by walking through the process of use, from sign up to reports. We write down our thoughts, ideas, suggestions and so on. So, what about the Microsite Masters SERP Tracker? Let’s find out! Pros: Pretty graphics, nice layout, pleasant sales video, user-friendly, clear calls to action. Microsite Masters offers flexible accounts that realistically follow the ebb and flow of client work; packages can be easily modified to higher or lower cost. As well, there are several levels, which makes it easier to find an affordable one. Cons: The first impression doesn’t give anything to make the site (and thus, the tool) stand out from the rest, so it’s easy to mix it in with all the other SEO tools out there. No trial feature (something Microsite Masters might consider). The first thing any person is going to see is, of course, the website. For us, if a site doesn’t follow at least the basic structures of optimization and marketing, we’re not going to bother reviewing the tool. Maybe it’s snobbish, but you should at least have the basics. Happily, this website has all the basics covered, including pretty graphs, reader-friendly content and a “we’ll solve all your problems” video. 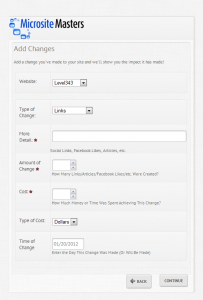 One of the first things we actively look for once we’re on the site is tool pricing. In our experience, the price generally points out how valuable the creators really think the tool is. As well, it shows how much of an impression they think the trial or free version will make. This SERP tracker’s creators apparently think it will make a huge impression; cost ranges from free (most limited version) to $299.95/month (most robust version). 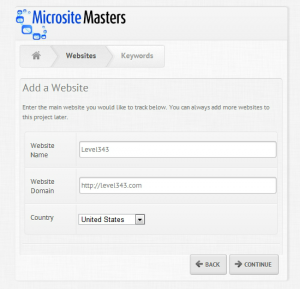 Microsite Masters promises healthy features that any SEO professional would love to have in their toolbox, if true. Unfortunately, they don’t offer a trial version of the more robust packages, which would give a healthy idea of the real product (you can see the feature list here and compare pricing plans here). While the upper echelon choices aren’t cheap by any means, it might be worth it for agencies. The major promised features: accurate daily rank tracking, automated features to track dozens of campaigns and the ability to determine ROI and associated SERP impacts. It looks interesting, and the promised ease-of-use (laid out in pretty pictures under the commentary about features) makes us eager to try it out. Side note: the site is easy to use and we appreciate the clear calls to action that are often missing on sites. However (and yes, it’s already been mentioned, but we feel strongly about it), we do feel that offering a trail version of the bigger packages would go a long way towards proving the tool. Finally (hint, hint, wink, wink, nudge, Microsite Masters), you might reconsider the placement of the “how to create campaigns” section. We almost missed it at the bottom of the features page. Pros: Sign up is quick. 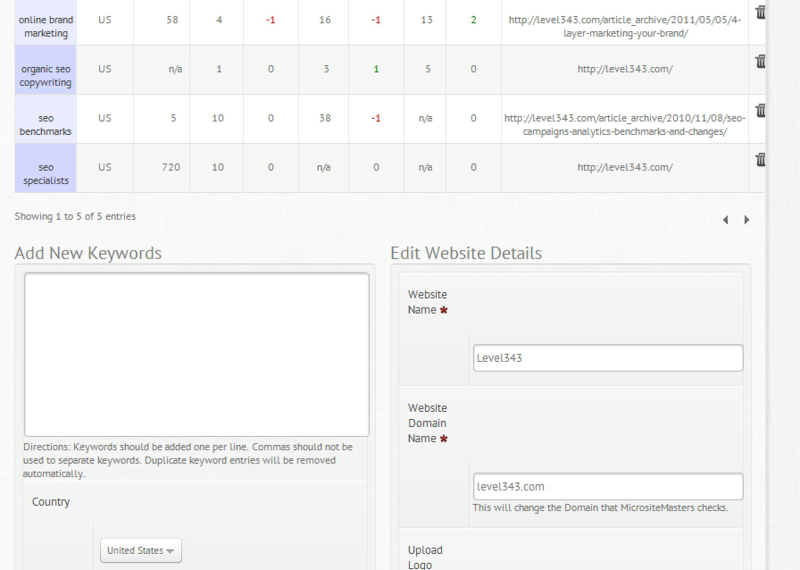 Setting up a new project, including adding new keywords, search engines to track and websites is extremely easy. Projects can be deleted, but a failsafe popup stops you from unintentional deletion. Cons: Setting up a project the first time around can be confusing. The sign up process was quick; it took less than two minutes from start to finish, with a stop off at our inbox to verify the email address. Nothing difficult or time consuming, which is a huge plus. We signed up with the free version, however, so the paid versions may take slightly longer. We hit our first snag while setting up the project. During the account creation, the tool offers the ability to create a project name; we did so, reset the password to something we could remember, and then clicked “Dashboard”. The site promptly logged us out, presumably to sign in using the new password. Signing back in brought us to a different spot (that was as yet unfamiliar). It wasn’t a big deal, it only took a few seconds to realize where we needed to go next, but that’s a few seconds of insecurity with a new tool. We’d already created a project name at the original prompt, so when we clicked the Project Wizard and it for a new project name, there was another moment of confusion. Having said that, we were able to add everything easily by treating it as a completely new project. Once the project wizard was finished, we had two “Level343” projects: one from the original setup, and one from the Project Wizard. The unfinished one has a place at the bottom to add a website and rename the project. Missed those, probably because the headings are grey, at the bottom of the page, and blend with the background somewhat. We deleted the initial (empty) project and went on. Projects are easy to delete, but have a warning pop up in case you click “delete” on accident. Good fail safe. Side note: The areas for adding information would be easier to see if they were pulled up initially and pushed down as more entries were added. Pros: This SEO tool gives what it promises. Cons: User experience isn’t immediately intuitive. The volume column can be misleading. For ROI to track correctly, you have to make sure user error isn’t involved. Okay, the project is created. Now what? There’s no immediate direction – just the user panel. We did what anybody would do and started clicking around. First click, Analyze SERP Changes. Oooo… This is different. “Add a change you’ve made to your site and we’ll show you the impact it has made!” It just got interesting; before, we were only surfing. It just so happens that we posted a blog recently, so we added the details for that. 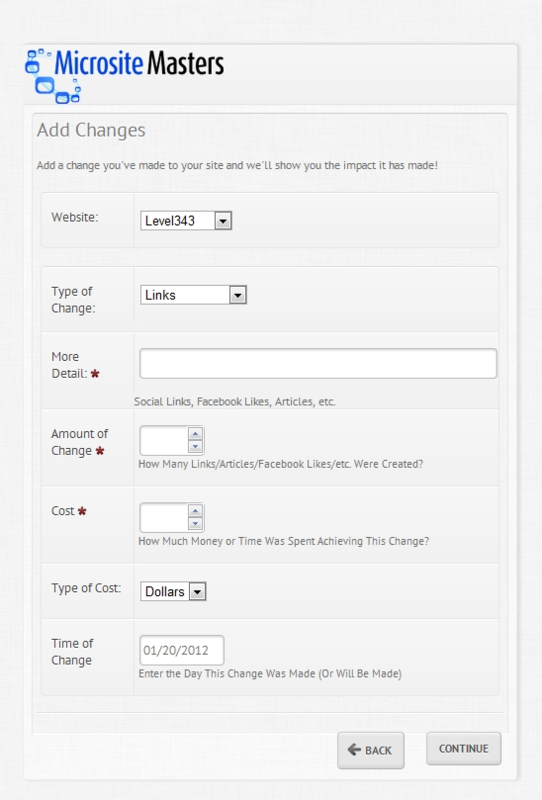 Analyze SERP Changes is also “Add Notes”, reachable through the side navigation. The “Links” dropdown lets you choose from links, onpage content, offpage content, new content and the ever broad “other”. Fill in the blanks with “More Detail” and “Amount of Change”. “Cost” is how much is cost you in dollars (by whole amount) or time (by hours). The Notes feature is extremely interesting, and ties in later with the project. Clicking “continue” gives you a list of the key terms you chose to track; this connects your changes with the key term rankings, to see how your actions affected your SERPs. To be blunt, we’ve never seen this option before, and are looking forward to seeing the results. One: When looking at this feature, our first thought was to put previous efforts into Notes. However, if the time of change is before tool started tracking, nothing will show up in the reports. On hindsight, it’s rather obvious that a tool can’t go back into time and track (at least, we’ve never seen one that could do so reliably), but, come on – isn’t your first instinct to shove as much information as possible into a tool? Two: You can’t go back and edit a Note once it’s created. We’d love to see a Note Center, where you can edit, delete, or view a list of created notes, as a way to keep track of what you have and haven’t done for the whole project. It isn’t there yet, and that’s frustrating. Here, we hit another snag, although, again, it only took a little clicking around to get back on track. 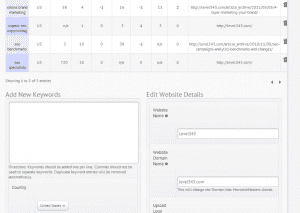 The main question is – where the heck are the keyword reports? How do you find them? Where’s the breadcrumb trail? As it turns out, you have to click the project name again; we had already done that to reach the view you see above. While this may seem like a small thing, it does make it less intuitive. Experience says clicking on the same link will take you to the same place. Side note: It might be more intuitive if the “keywords” section becomes highlighted instead of the “website” section. Although viewing the keyword results isn’t intuitive, adding more keywords to the campaign is. It’s quick – and you can add several at a time (think SEOMoz and Raven Tools interface for adding key terms). This is a definite plus for campaigns that need hundreds of terms tracked. Digging into the Knowledge Base reveals another big plus. 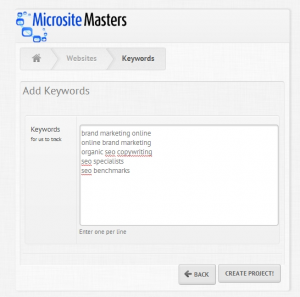 Microsite Masters doesn’t count three search engines as three different keywords against your tracking limit. In other words, if you want to track “SEO specialists” across Google, Yahoo and Bing in the U.S., it only counts as one key term. The “Volume” column can be misleading if you don’t read the Knowledge Base information. Volume is provided on an “exact match” basis, not a “phrase/broad match”. “The information provided within Microsite Masters from SEMRush is not a replacement for obtaining metrics from Google as its intended purpose is to sort keywords by search volume to quickly analyze data sets inside of the Microsite Masters interface.” So, unless you’re interested in exact match information, this number only serves a purpose for reordering and qualifying terms. If you see a low number for a term you thought was a high volume query, don’t freak. It’s just Microsite Masters. Side note: This might be information better served in a tool tip format on the actual page. The expanded view at keyword level is a handy feature. If, for example, you have a blog like we do, you may also have more than one page ranking for a given search query. Microsite Masters gives you the ability to dig down into the key terms, sharing information about the other pages that also rank for that term. 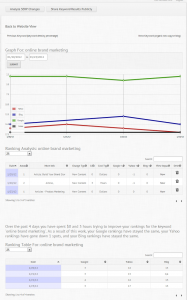 As you can see from the screen shot, we have three pages that rank for “organic seo copywriting”. We can automatically see the benefits to this level of detail. If, for example, we see a page that isn’t ranking, but is optimized and has been targeted for these terms, what looks like a bunch of numbers on the SERP tracker becomes actionable data. We may not be able to see why it isn’t working, but the creators don’t promise that. Where Does the ROI Data Come In? Throughout the walk through, we haven’t seen a single sign of ROI tracking. Where’s it hiding? –And what happened to those notes we added? Clicking on a keyword reveals the truth, and it’s awesome (click on the picture to see a bigger version). Now, we didn’t spend the time to put in real numbers for the cost data, and the notes we put in weren’t necessarily targeted for “online brand marketing”. We just wanted to see how it worked – and here are the goodies. Graphs – the graphs (by the way, the creators thoughtfully made the colors customizable) make it very easy to see what’s happening at a glance. We’re ranking high on Google for the term, while Yahoo and Bing don’t like us as well. The black line is our ROI, which is pulled from the notes we entered. The “view impact” column will eventually update in 7-day intervals. Ranking Table – Another big plus is that Microsite Masters updates the rankings every day. Quite simply, it’s like watching your SERP rankings in real time. Again, we can automatically see benefits here – not the least of which is this: as soon as your rankings start falling, you can add another blog, link, etc. targeted towards the key term in order to stay on top. Very nice! Finally, we also have the SEO Scoreboard. It doesn’t really show much for us – we only entered 15 key terms after stepping into one of the bigger versions to test. This isn’t available to the free version, due to the fact that it requires more than 10 terms to work properly. However, you can see the applications for those with a big list of key terms. It isn’t “prettified”; there aren’t any pictures, pats on the back or anything else. It’s a raw showing of which keywords are doing well and which ones need rescuing. Frankly, the SERP tracking tool still has some issues, as noted in the review. However, none of them are big enough to make this tool unusable. It delivers on what the creators promise, to a very large extent. Most of the issues are with the user interface, and can be ironed out within a few minutes. If you just want to see how your site is performing for a few keywords and don’t care about printing reports, the free version will do fine. -Which brings us to the fact that some of the promised features are not available in the free version. For example, exporting results in CSV, PDF reports and so on aren’t available. 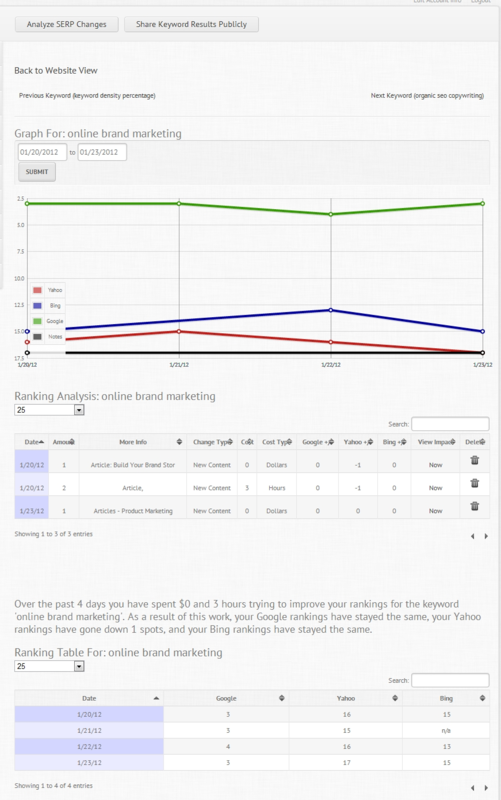 As well, the free version only allows 10 keywords, so the SEO scoreboard won’t work. In our opinion, that’s something that should be considered in the site’s content. These are blanket promises with no caveats. While the reports aren’t needed for anyone other than a professional with clients, the SEO scoreboard might come in handy for small businesses with a DIY mind frame. Signing in to find out that the scoreboard wasn’t available was disappointing. SEO professionals and agencies may shrug and say “well, I can get most of that from this or that tool,” and they might be right to some extent. However – this is the first tool we’ve come across that compares actions to results in an easy to digest manner. As well, most of the features are seldom available in a single tool. The creators try to add 3-5 new countries every month, and create updates based on “client-sourcing”. The ideas come directly from the users. The Notes Center that we’d love to see is in the planning, and they’re currently looking for more options to take the public results sharing to the next level. They’re openly interested on what we’d like to see, and work to improve the product. Once some of these features/functions are available, we fully expect to be able to rank the Microsite Masters SERP Tracking tool at a full 5 stars! Visit the Microsite Masters site, browse the features and snag a free version now to test… guaranteed, some of you will be grabbing one of the premium versions!